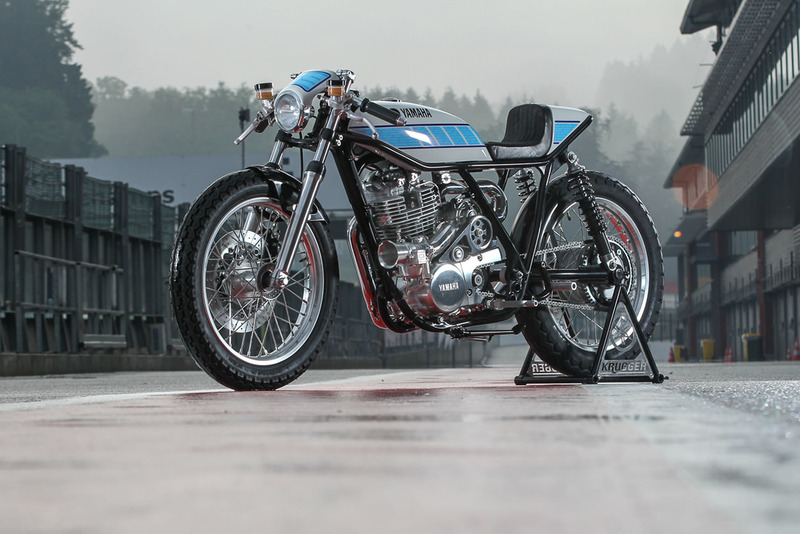 We’re not sure how much longer Yamaha can keep the iconic SR400 on its roster. With European emissions laws tightening, its days are numbered. 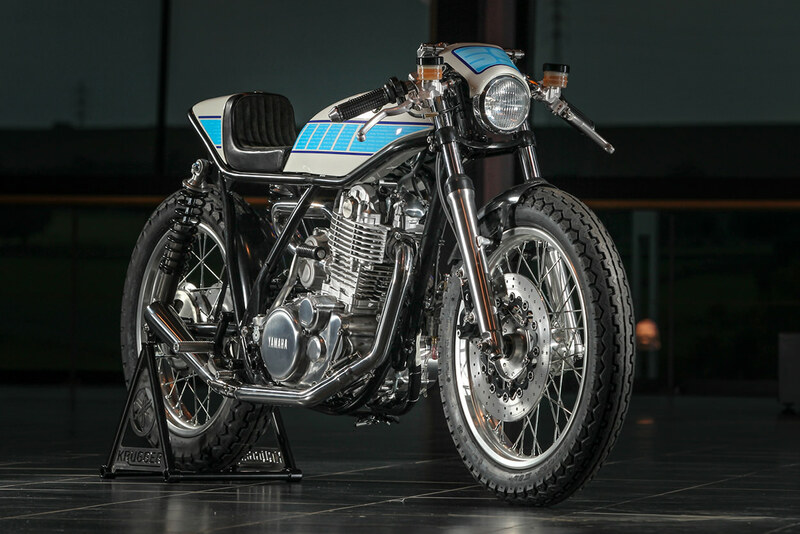 Still, the plucky little thumper remains a favorite with custom builders—even superstars like Belgium’s Fred ‘Krugger’ Bertrand, who has won the AMD World Championship twice. 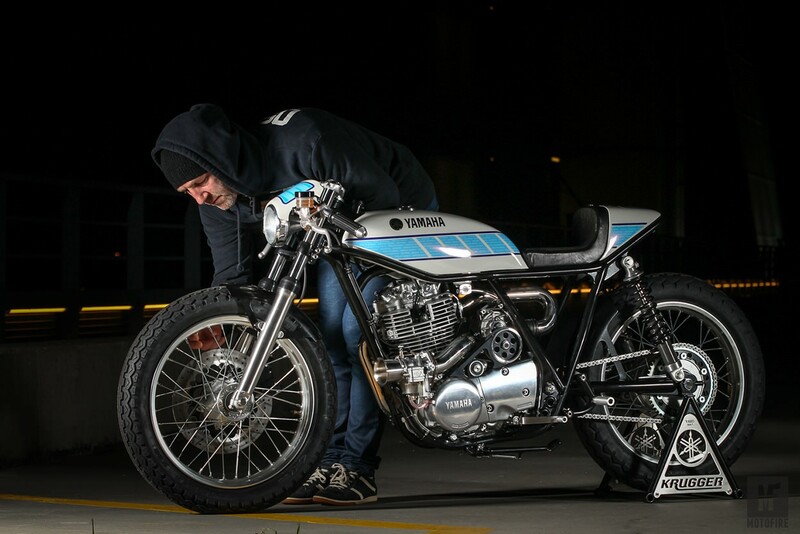 When Fred was asked by Yamaha Motor Europe to build a bike, any bike, the SR400 was his top pick. The brief was wide open, so Krugger decided to build a compact cafe racer: a supercharged tribute to another very skilled Belgian bike builder, the MotoGP mechanic Bernard Ansiau. 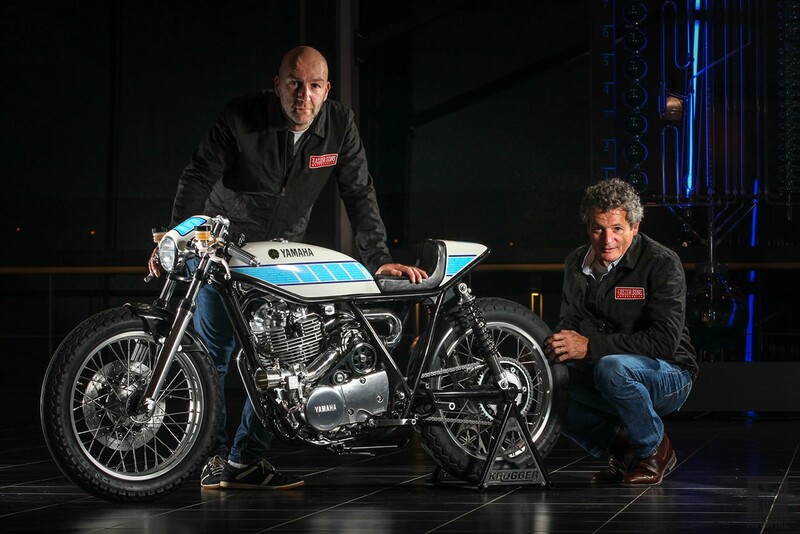 Bernard currently swings the spanners on Valentino Rossi’s Yamaha—and has worked with greats like Wayne Rainey, Kenny Roberts and Mick Doohan. 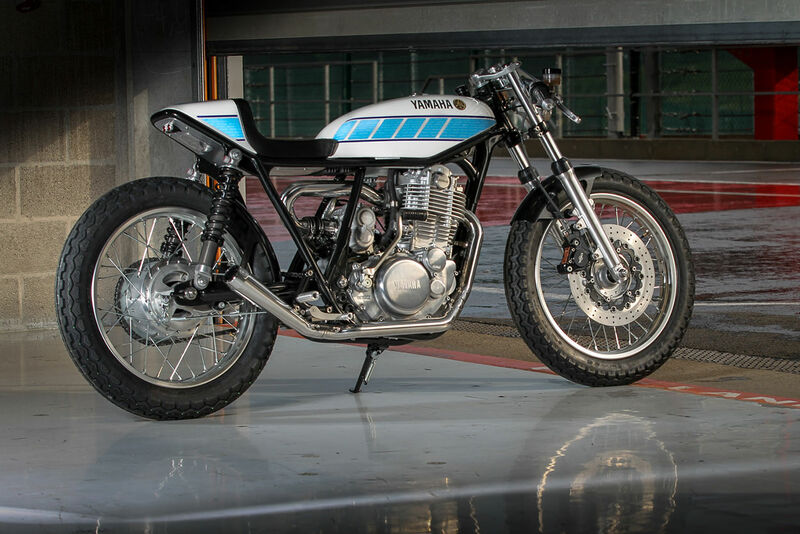 The SR400 now looks far more racy than when it rolled off the assembly line. And there’s a helluva lot going on under the hood: Notably a tiny Aisin 300 supercharger—also used by Subaru for its smaller Japanese market cars—along with a custom plenum chamber and a belt-drive setup for the compressor. 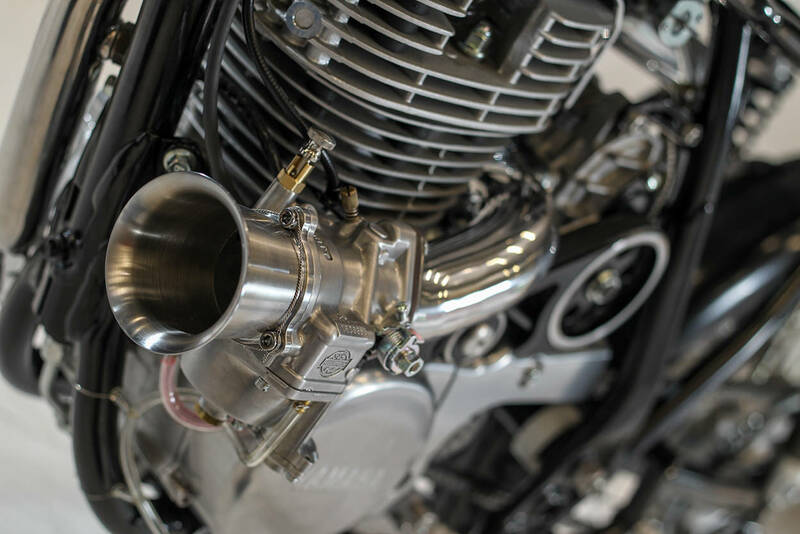 The SR400’s fuel injection is gone too, replaced by a 48mm carb from S&S Cycles and a hand-made intake. (It’s designed to run with either an open velocity stack or a filter.) And the stainless steel exhaust system is a one-off. The tank is stock, but it’s been narrowed and stretched. Krugger has also reworked the frame—cleaning up the welds, modifying the junction with the steering neck, and reconfiguring the rear loop at a steep angle. 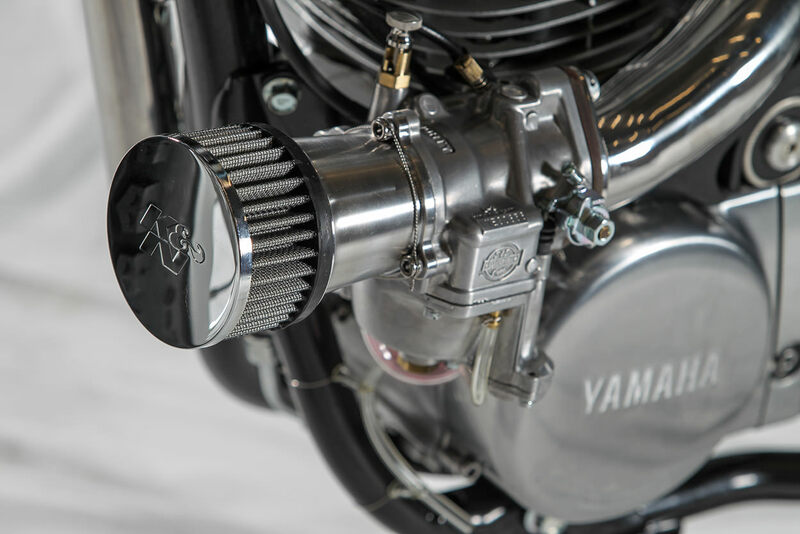 A custom tailpiece houses the electrical components, and there’s a small cowl up front to cap things off. The forks have been lowered and polished, and there’s a new set of Fox shocks holding up the rear. 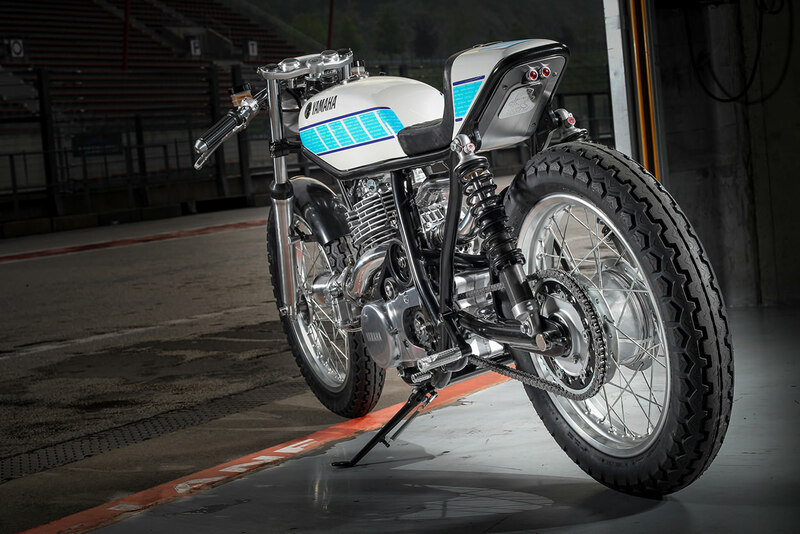 Krugger’s tires of choice for this build are Dunlop K81s, based on the pattern of the first tire to lap the Isle of Man TT course at over 100 mph. The looks remain the same as the 1969 original, but the rubber compound has been brought up to date. The list of mods grows longer—and even more desirable—as you move to the cockpit. Behind the cowl is a tiny Motogadget speedo, along with their switches and grips. The handlebars are custom, and so are the foot controls—which have been machined to match the grips. The top triple clamp has been cleaned up. Beringer has supplied the front brake and hydraulic clutch, and Krugger has machined cutouts into the rear brake drum. 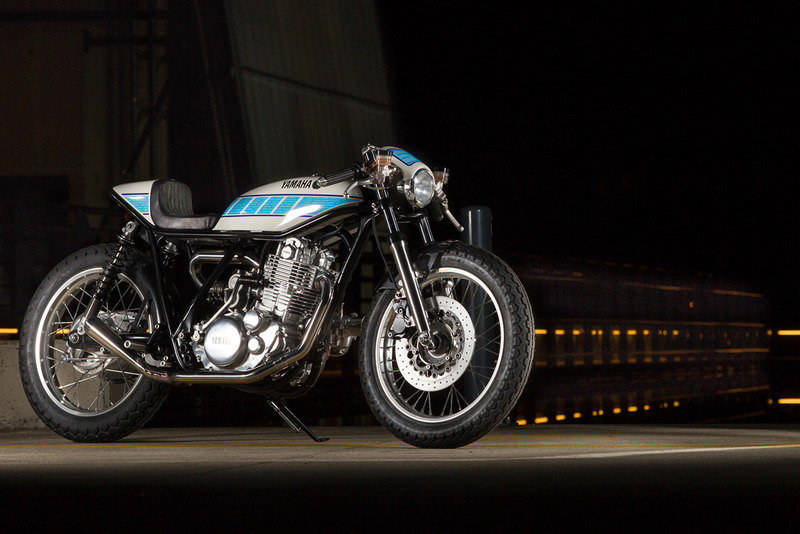 Krugger initially wanted the SR400 to be a little less ‘slick’ than his typical creations, such as the jaw-dropping BMW K1600 ‘NURBS.’ But when it was time to finish the SR400 off, he couldn’t help himself. He prides himself on his “better than factory” reputation, and this project is no exception. 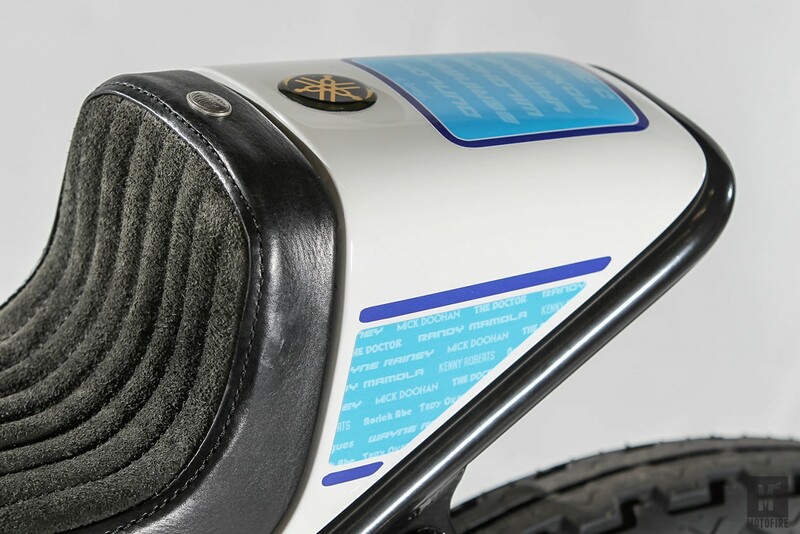 The bike is laden with hidden details, like meticulously wound safety wire all over. Blue is the color of MotoGP’s Bernard Ansiau, so Krugger has used a blue speedblock-inspired livery. 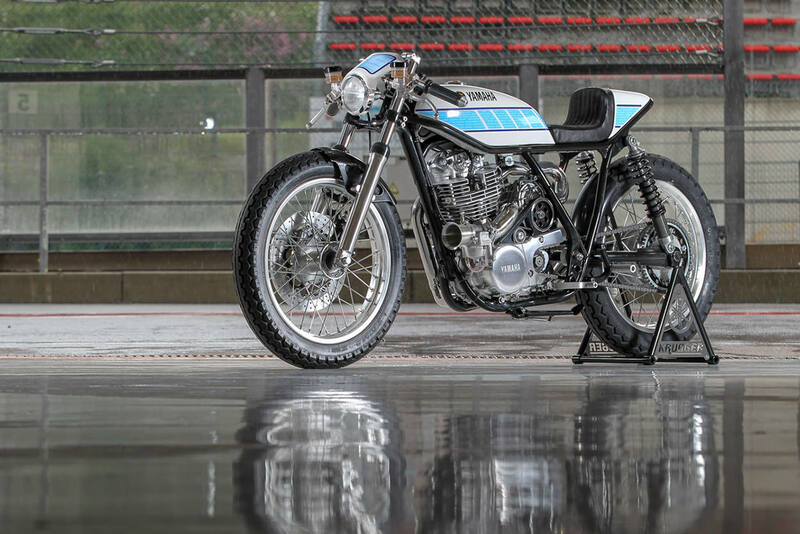 Look closely, and you’ll notice the names of all the racers Bernard’s worked with… from the above-mentioned superstars to riders like Randy Mamola, Norick Abe and Taddy Okada; and riders he admires, like Alain Chevalier. Once again, Krugger’s obsessive level of work has blown us away... Now hurry and find yourself a SR400…while you still can.